Inspirational & creative ramblings of a self-confessed geek – Things I like, things I find and things I’m doing. Now that I’ve recovered (and dried off!) I can look back proudly on the Winter Ballbuster from a couple of weeks ago. Following on from my first (and only other) duathlon last year I considered the next logical step. A harder, longer, hillier duathlon of course. I was perhaps somewhat naive in just how hard the Ballbuster could be, even with my confidence of doing quite well in the Leatherhead Duathlon (I placed 14th since you asked) it turned out to be even tougher than I imagined. 8mile run (1 lap), 24mile cycle (3 laps), 8mile run (1 lap). A few weeks before the event I read that the Ballbuster was billed as the UK’s toughest duathlon and indeed “one of the toughest endurance challenges in the UK”. Ah. Well, I suppose it had to get the name from somewhere! Still, my target remained to finish inside 3hours 45minutes. The night before the race I packed my plastic box for transition from a meticulous list and settled in for an early night. I’ve only ever had indoor transitions before where you can lay everything out neatly, but with an outdoor transition area and heavy rain forecast I needed to try and keep everything dry! The next morning my alarm went off at 6am and I rolled out of bed to find that the weather was deceptively mild and, despite the relentless forecast all week, not yet raining. 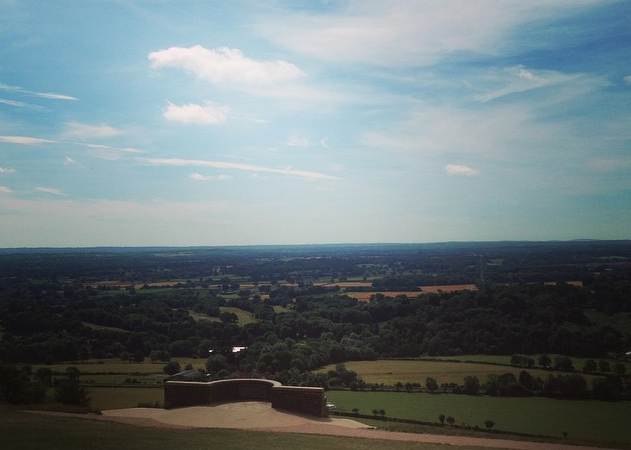 I queued up the final stretch of Box Hill to the car park (note to self: leave earlier next time!) and queued up again for registration. I needed to buy my first BTF licence and once I’d picked up my timing chip I headed off to rack my bike and warm up. Nervous smiles and small talk filled the atmosphere at the briefing. There was a real mix of people, those looking to win, those aiming for PBs, and absolute first timers just hoping to make it round. Most people, myself included, had a few nerves but just wanted to get out on the course. I was most nervous about the second run. 40% of the course distance was on foot, a much bigger chunk than I was used to and I would have to pace myself to save enough for a final 8 mile stretch. Approaching the start line in pulsed starts I soon found myself in the next group to go. The horn went and, with the familiar beep of my Garmin, I was off. Despite my plan to set off at my own pace I inevitably set off too quickly. Adrenalin pumping and trying to weave out a clear space to run in it took me a few minutes to settle down into my rhythm. The wind was increasing but it still wasn’t raining which I was grateful for. After the first lap I was feeling pretty good, I was right on my predicted time and even with a slightly slower than hoped transition I was off and pushing hard on the bike down towards Headley. I personally find the transition from run to bike fairly easy. Your legs are really warmed up and have a natural impetus making for good momentum between disciplines. From the run I knew what goes down must come up again, so it was a case of trying to enjoy the downhill sections and keep up a decent pace knowing my average speed would suffer on the climbs. Grinding up Zig Zig Road there were comments of encouragement between breaths from other competitors. I even managed a short conversation with a similarly paced cyclist on one lap. I say “conversation”, we were both cursing the headwind through pained grimaces whilst pushing on. Mild comfort that others were beginning to suffer like I was. Seeing my family as one of many small clusters of supporters dotted about the route was a huge boost. Multiple laps of any course can a be a challenge mentally, but with the infamous climb up Zig Zag Road looming every lap anything that lifted morale was welcome. At the start of the third bike lap the heavens opened. Sheet rain and crosswinds slapped us about and it was all I could do to keep going. The middle section of the course was already wet and littered with leaves and twigs and the weather was only making it more treacherous. I only came close to coming off the bike once, some sort of marvel considering the wet and slippery leaves that lined the twisting downhill sections. Blinking through the rain I took a corner far too quickly but managed to hang on to the back wheel that felt it would be more suited to the floor than remaining upright. With a naturally slower speed on the hills I took the opportunity to take on energy gels and my trusted cycle snack, malt loaf! By the time I hit T2 the transition area was a mud pit. Sliding my way through I racked my bike, changed shoes again, and headed back out on the course. Starting the second run I might as well have had kettlebells for feet the effort it took to keep putting one foot in front of the other. After a couple of miles I realised that any other competitors were thin on the ground. Gone was the morale of other competitors or anyone to pace myself against. Just me and the now small river running down along the roadside. The final time up Zig Zag Road was a lonely run. Eventually rounding the final switchback a group of supporters cheered me on and I managed to pick up the pace ever so slightly knowing the finish was so close. I can see the finish line! Through the finish line I was utterly drained. Physically I was beyond exhausted but mentally I was jubilant and spirited that I’d achieved so much and had finished quicker than hoped, even in torrid weather conditions. I’d earned a much-coveted BallBuster hoodie (the Ballbuster doesn’t do medals) along with a couple of blisters and some very stiff legs. My overall finish time was 3 hours 37 minutes (time splits are on Strava: run 1, bike, run 2). I was particularly pleased I managed my second run to be within four minutes of the first despite it feeling like much more! Would I recommend it? Yes, absolutely! Especially if you like a gruelling course, a relentless climb, and almost certainly terrible weather! I’m already hoping that the Spring BallBuster in 2016 will have better weather to help me improve my time and finish under 3hours 30min. Credit for all professional photos Sport Cam. 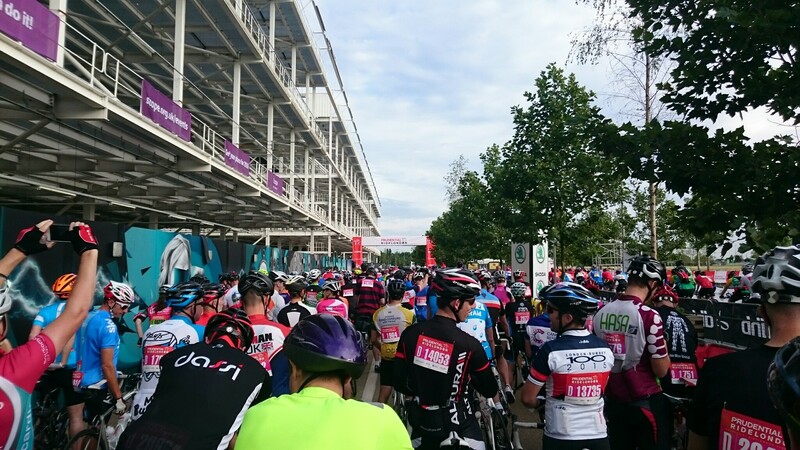 If you follow me on Instagram you will have seen that at the weekend I took part in the Prudential Ride London-Surrey 100. 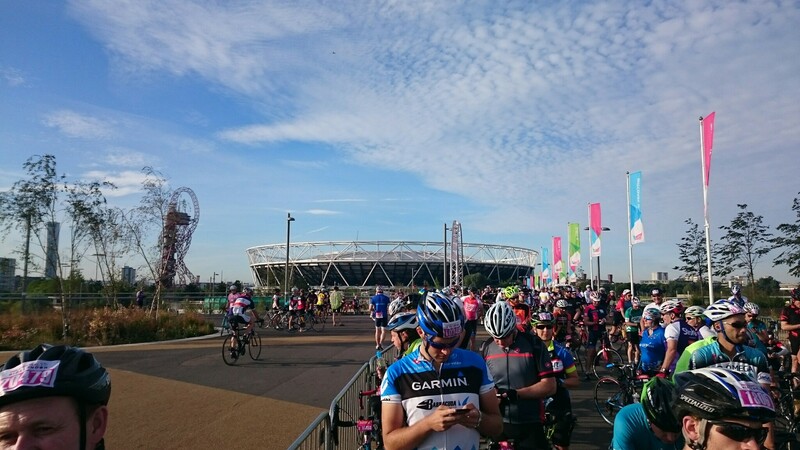 As part of a weekend festival of cycling the route was a 100 mile closed road course that started from Queen Elizabeth Olympic Park, wound its way through London and down into Surrey (largely inspired by the 2012 Olympic route), then back up into London again for a grand finish on The Mall. In preparation I’ve been upping my cycling over recent weeks, and whilst I have ridden 100 miles a few times before I’ve never done it on closed roads. Not having to stop at traffic lights or give way at roundabouts was a big draw to the sportive for me, being able to maintain a higher average speed around the 20mph mark I was hoping to get round inside six hours. Meticulous list checking and packing the night before (through fear of forgetting something!) meant that I was ready to go come 6am on Sunday morning. 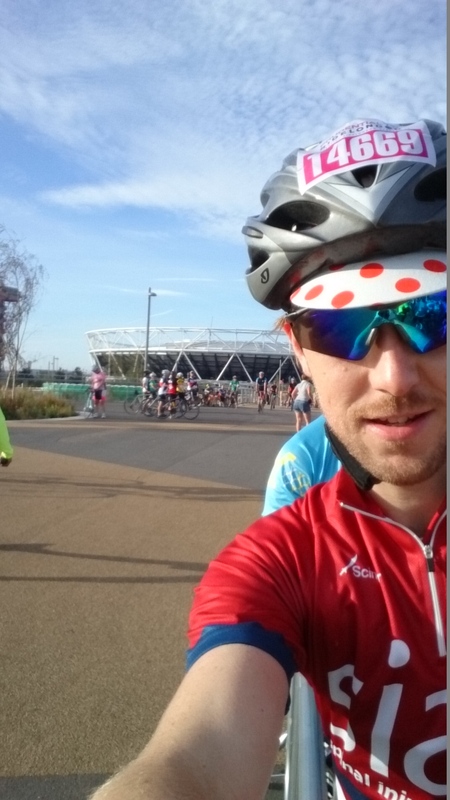 The forecast looked like it was holding out for sun and fresh breeze welcomed me as I made the relatively short 9-ish miles warm up journey from Camden Town to get over to Stratford, gradually joining more and more riders heading in the same direction. Once at the park I joined my start wave and joined in the masses taking photos. A beautiful morning surrounded by the stadium and the ArcelorMittal Orbit it was a definite photo opportunity. Lovely views while we waited! Superb organisation from the stewards moved the 25,000 or so cyclists slowly forward in their respective waves, and right on schedule at 07.51 to the minute we were off with Ride Of The Valkyries booming out the speakers. I was hoping to fall in with a group of similar paced riders to gain the advantage (and respite) of drafting and taking turns on the front but with a range of mixed abilities in our wave it took a few miles of weaving and bunch riding to thin the crowd out out enough to do this. The group riding contained a friendly atmosphere and everyone seemed to have the same thing in mind which meant it was a constant flow of dropping slower riders and being dropped by faster riders back and forth. There was always enough riders to catch you up and pull you along if you were flagging a bit. What was really interesting over the day was the range of bicycles people were using. I wouldn’t have dreamt using anything other than a road bike for 100miles but I saw full suspension mountain bikes, hybrids with pannier bags, even someone with their arm in a sling who rode the whole thing one-handed! 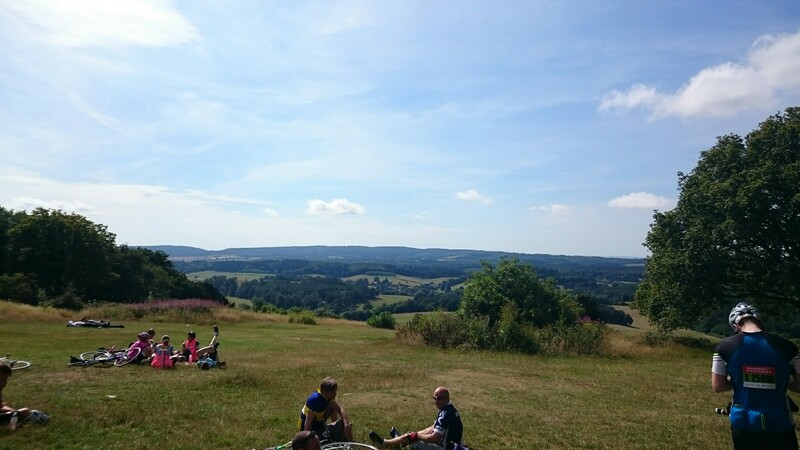 My first planned stop was about halfway at the top of Newlands Corner at one of the route hubs. 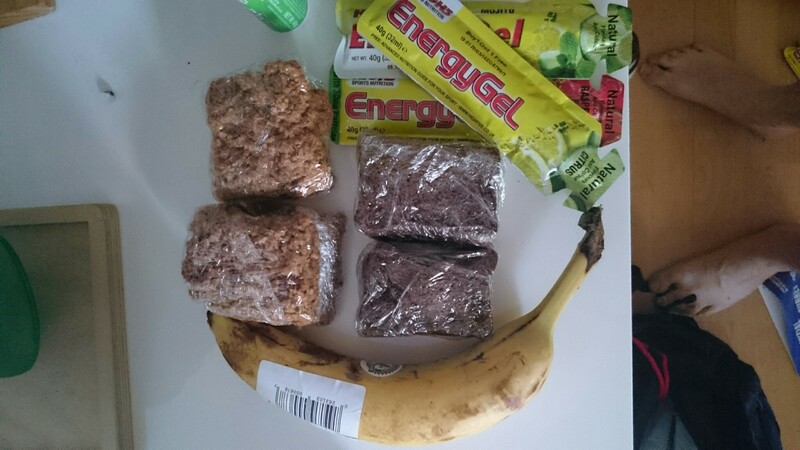 A top up of High5 energy drinks and flapjacks gave me sufficient replenishment and I was back on my way. 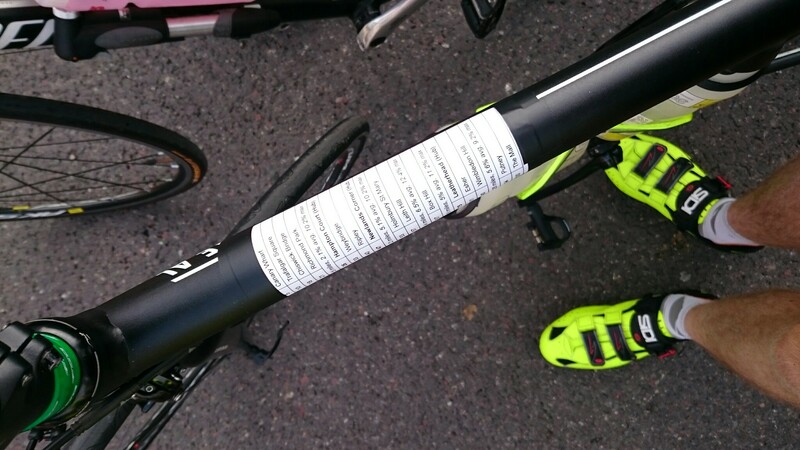 You may have seen in the news the tragic event that happened on the second of the climbs in Surrey, Leith Hill. My thoughts are with his friends and family. I was one of the several hundred riders caught up in the backlog of this, ultimately walking up the narrowed road before a formal diversion was put in place. More information here. 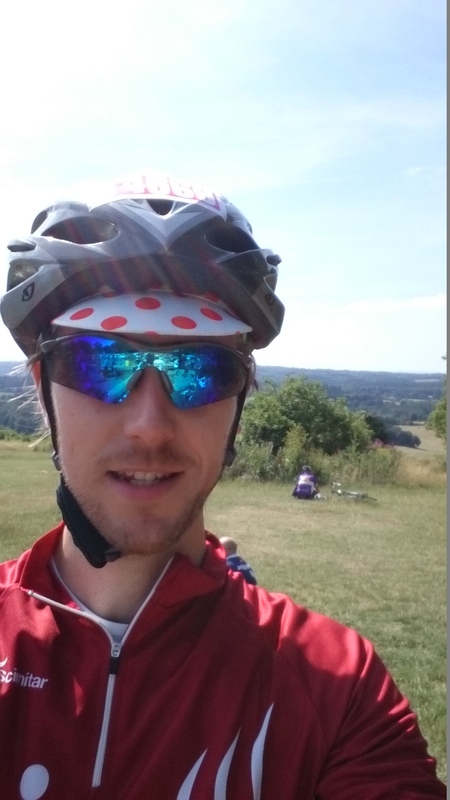 The third and final hill (in Surrey) was Box Hill and gave superb views, a just reward for the winding climb up Zig Zag road. I paused to take in the view but didn’t actually stop for any photos. This one is from @bexmcc1 on Instagram. The smaller towns and villages in Surrey had great support and festivities. People out by the road cheering and waving us on, it was quite an immersive experience. Once into Dorking and heading back up to London the barriers were out along the roadside and it really makes you feel like one of the professional riders. My second stop was around mile 80 in Esher for a final boost to carry me through. 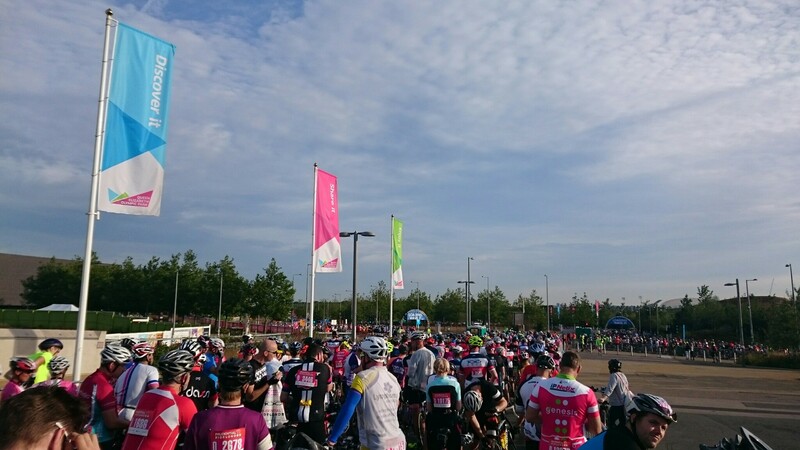 Most people think that the route from Surrey into London is flat, but Wimbledon Hill, although fairly short, peaks at around 9% which is a tough climb with already heavy legs. Turning onto The Mall was spectacular. Although a bit of a blur it was quite an incredible feeling. The final straight, barrier and banner lined with hundreds of people cheering you on, I gave it my all and sprinted the final 100 metres or so. In my head I was overtaking Mark Cavendish to take the win, but in reality I was so happy to complete the route and well within my target time! 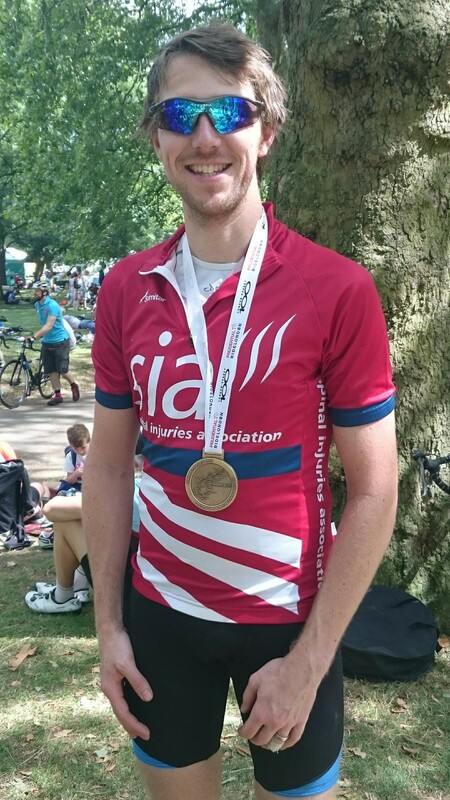 Although I wasn’t formally raising money for a charity on this ride I did get chatting to Spinal Injuries Association at an exhibition the day before (I fundraised for them running the London Marathon a few years ago!) and wore one of their jerseys to help spread their name and raise awareness. If you would like to make a donation to them please visit their site. I could not have asked for better weather, glorious sunshine and gentle breeze most of the way. You can view my complete ride on Strava here. Afterwards I met up with my wife and daughter (and a beer!) 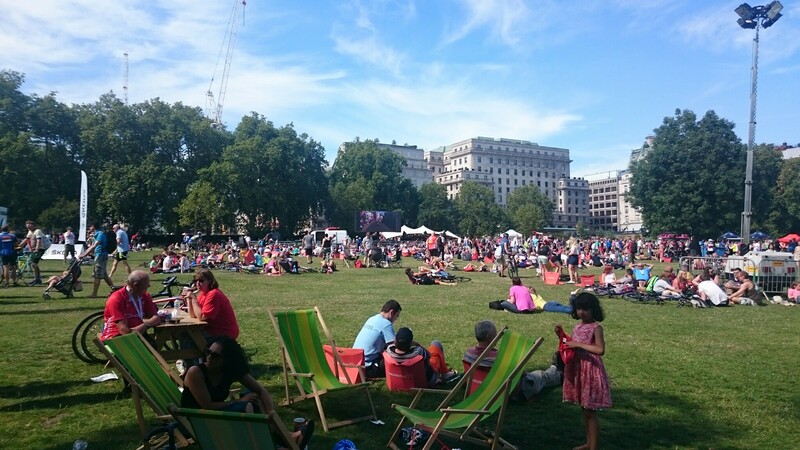 to relax and watch the professionals ride the same course on the big screen in Green Park. A really fantastic day, well organised and very well supported. A huge thank you to the marshals, stewards, volunteers, and everyone else that made it possible! Now that my legs have recovered here’s hoping I get a spot in the ballot for next year too! 100 is a significant milestone in anything, let alone something as celebrated and monumental as cycling’s “le Tour“, the Tour de France. 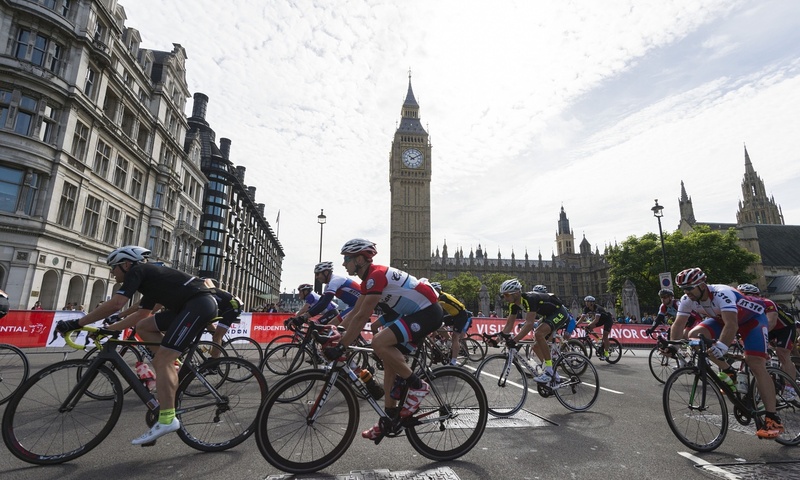 This summer from 29 June to 21 July represents the 100th edition of the race. As if that wasn’t exciting enough, the race organisers recently released this trailer for the event. Epic stuff. An extremely inspiring montage to encourage you out on your bike! More great moments in history from the Tour here. As cycling becomes ever popular and embraces new styles and trends something that many cyclists are doing is using is using helmet-mounted cameras to record footage of their time in the saddle. Whether that’s on the road to highlight good or bad behaviour from motorists (and fellow cyclists!) or simply showing off tricks and stunts off-road. Either way what you get is the view from on top of their helmet. In a unique twist in capturing images whilst riding your bike, sports photographer Tom Olesnevich caught my attention with a very particular viewpoint. Yes they are shot from a bike still, but the slightly unusual angle from which they are taken is essentially the bike‘s point of view. The project is rather aptly named NYC By Bike. All the images were taken on a Nikon D40 and bravely mounted to the bicycle with a GorillaPod. An infra-red remote triggers the capture. The complete set of images from the project is on his site here. “Rising from Ashes” is a feature length documentary charting the impossible triumph of cycling’s Team Rwanda. This trailer does exactly what a brilliant trailer should, it makes you desperate to see the film! Two worlds collide when cycling legend Jock Boyer moves to Rwanda, Africa to help a group of struggling genocide survivors pursue their dream of a national team. As they set out against impossible odds both Jock and the team find new purpose as they rise from the ashes of their past. Look for a screening near you here. Long term readers here will know I’m partial to the odd post about cycling, most recently taking note of the cardboard Kranium. Well, Kranium should prepare to share the limelight on the innovative podium for cycle helmets as Hövding has landed on the scene. Hövding is particularly good for people that don’t like to wear a helmet but still want protection. A few months ago you’d be forgiven for laughing and saying that’s not really possible, but with ever improving technology (and a hint of inspiration from car air bags) Hövding has been born. Anna Haupt and Terese Alstin came up with the product as part of a university thesis project, designed to be deliberately unobtrusive—until it saves your life, that is. 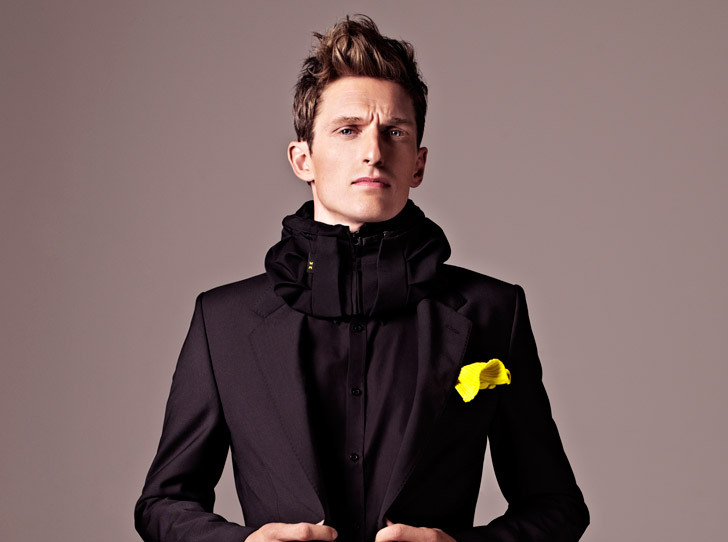 Hövding is one for the style conscious riders, a two part collar and shell combination zips neatly around your necks and containing a head enclosing airbag which inflates in one tenth of a second when in an accident. 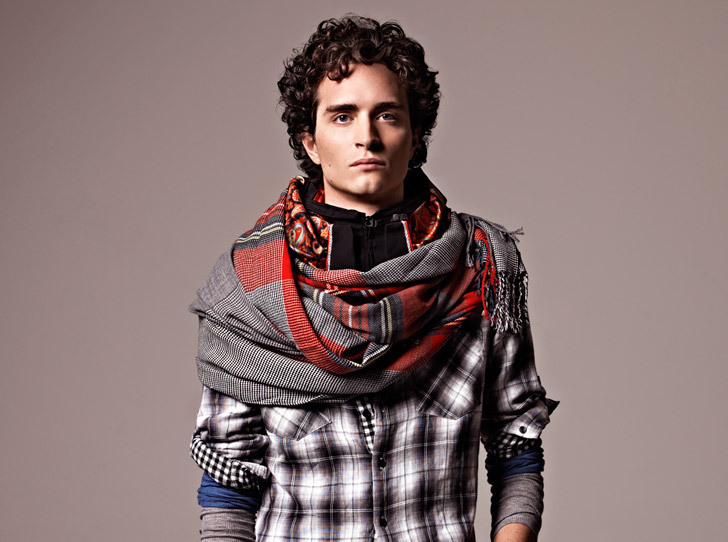 It is easily disguised as part of your outfit with the odd scarf if you still can’t bear to be seen with it, but works equally well with a smarter ensemble as they demonstrate. Contained within the collar is an inflatable device, helium cartridge, a set of gyroscopes and multi-axis accelerometers which allow it to inflate in one tenth of a second when required, and a black box to record collision data. Very impressive, but it doesn’t end there. The technology inside isn’t your standard sensors used in your Wii remotes, oh no, this can actually tell the difference between falling from the bike and bending down to tie your shoe. It helps those riders whose vanity prevails over sensibility and avoids dreaded “helmet hair”. Whilst “helmet hair” is never ideal, it’s always been preferable to cracking your head open, but now you no longer need to make the compromise as Hövding only ‘pops up’ when needed. Some of you are probably screaming “just wear a helmet!”, but the truth of the matter it’s not that simple. I actually think my cycle helmet makes me look quite cool but there are a lot of people that don’t feel the same way about themselves. Plenty of people don’t wear them because they find them uncomfortable and ill-fitting, or they feel un-fashionable or self-conscious and so if this is the product that gets them wearing something that protects them during a crash and means their safety is increased then great, that makes it an excellent product in my book. If you want to learn more then check out the site with all the developments and details on the workings of this product. As a keen cyclist I’m always interested in new products and equipment, however futuristic or conceptual they may be, but this one caught my eye as it’s all about doing something now. 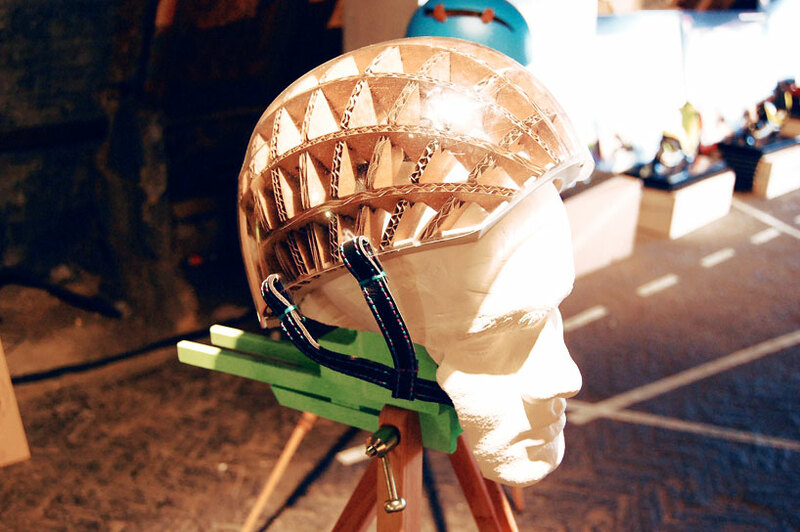 Anirudha Rao has developed Kranium – a lightweight and bespoke solution for cycle helmets. From the mid-range of the helmet market upwards they all become about styling towards aerodynamics and weight reduction. I mean mine’s not heavy, but let’s face it I’m not an Olympic sprinter where those few grams could make a difference. Aside from the odd stint of off-roading I use mine on the commute. Stats reckon that cycling through a busy city averages a speed of around 12mph, which I can indeed vouch for (my 9.5miles takes 42minutes), and so for me (and no doubt many others) safety is becoming more paramount than streamlining. Your typical cycle helmet is an expanded polystyrene (EPS) core with a thin moulded microshell overlay and we just presume that this is the best material to protect us. I mean, you could spend £100s on a super elite helmet and it would still be mainly EPS (though with increasing amounts of carbon fibre). Recent research however, is beginning to suggest that cardboard assembled in the correct way could offer similar, if not improved, protection. 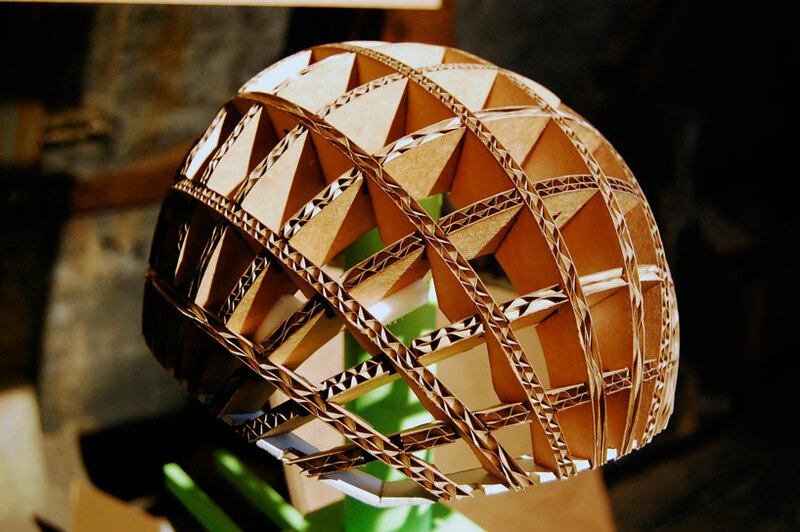 This is largely because EPS tends to distribute impact energy in an attempt to dissipate it, whereas Rao’s design gives the cardboard a crumple zone to attempt to absorb the energy before it reaches your head. When tested at Imperial College (against BS EN1078 since you asked) it was found that this cardboard arrangement absorbs four times the impact energy than that its traditional EPS counterpart, an impressive feat indeed. Kranium is also really promoting the fact that during testing it can withstand consecutive impacts, though should this reach market I believe that it will fall in line with current helmet guidelines of changing your helmet after a sinlge impact. Testing has very specific and fixed conditions, whereas out in the real world any number of factors can affect results, no doubt erring on the side of caution, as EPS helmets do, is something you simply must do when it comes to safety. 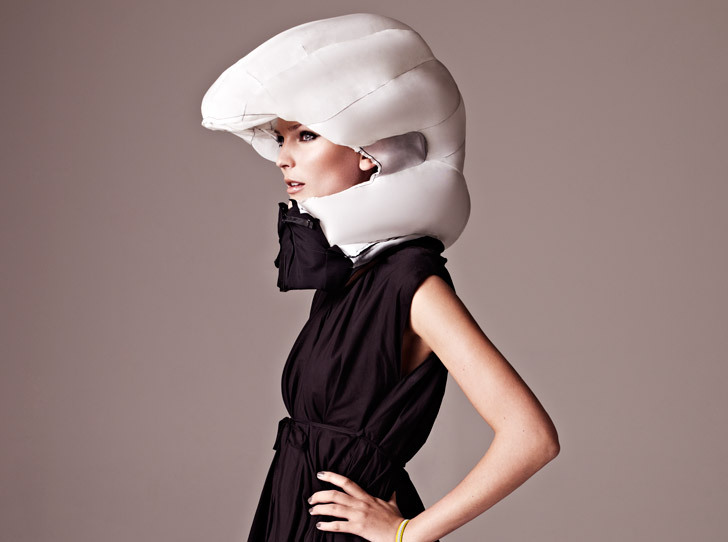 Comfort is a huge factor in people wearing cycle helmets. Head size and shape varies greatly throughout the population yet the majority of helmets merely come in standardised small, medium or large. Whilst Kranium could do this too, why not exploit one the advantages of its manufacturing method. A fairly simple (and nowadays none too expensive either) 3D head scan could pinpoint coordinates for the laser cut cardboard template giving you a perfect made to measure fit for your ride. The data could easily be stored on file allowing repeat helmets to be ordered for a fraction of the cost in the future. Investing in a bespoke product that you’ll use and use again, great idea. Obviously a few developments will still be needed to get this product to market. Just looking out the window this evening a wet weather option is a definite must so the cardboard doesn’t degrade, perhaps laminating or wax coating the cardboard is an option. Should it make it I would really be tempted by the white version above. One immediate application I can see for this is not necessarily in the bespoke market though, but alongside London’s recently introduced “Boris Bikes”. Following a recent call for helmets to be provided this could provide the mayor with an opportunity of a cost effective and eco-friendly solution. And you can see how easily it goes together with a neat little clip on Vimeo here. Images courtesy of Design Boom.